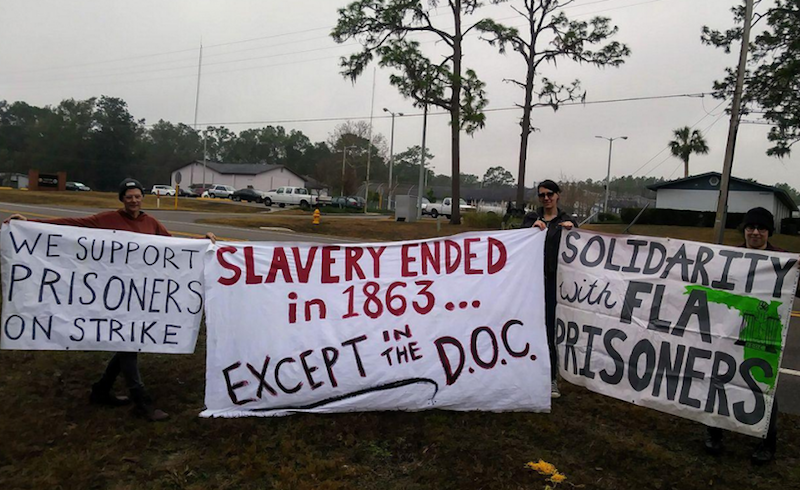 Demonstration in support of a Florida prison strike, January 2018. via IWOC/Twitter. Initiated by Jailhouse Lawyers Speak (JLS), a collective of those providing legal aid and support to other prisoners, this year’s strike highlights the movement’s growing sophistication. JLS, which first announced the strike via Twitter, intentionally picked dates that bridge the anniversary of Jackson’s killing with the start of the 1971 Attica prison rebellion on September 9th. Previous national and statewide protests have demonstrated a similar political consciousness, indicative of organizers seeking to cultivate a sense of their movement’s place in history. The 2016 nationwide strike began on the 45th anniversary of the Attica rebellion (September 9th), the 2018 #OperationPush strikes in Florida coincided with the Martin Luther King Jr. holiday (January 15th), and the subsequent call for outside supporters to demonstrate fell on Juneteenth (June 19th), a holiday commemorating the emancipation of enslaved Africans in Texas following the end of the Civil War. These recent actions have been just a few of the coordinated protests that have broken out in the years since the 2010 work strikes throughout prisons in Georgia as well as the 2011 and 2013 Pelican Bay hunger strikes. Building on the lessons drawn from these and other protests, this national call prescribes a set of actions to take and a three-week window of time during which to take them, in order to deny prison officials the opportunity to preemptively lockdown their prisons in anticipation of a one-day refusal to work. Reflecting a growing operational flexibility, the national call also encourages those taking action to press concerns specific to their institutions, while also promoting a common set of ten demands. These demands include an end to felony disenfranchisement, poor prison conditions, racist over-charging and excessive sentencing, low — or in some instances, no wage — prison work policies, and repressive federal legislation like the 1996 Prisoner Litigation Reform Act (PLRA), a law designed to curtail the ability of prisoners to file federal lawsuits for violation of their constitutional rights. Although far from low-hanging fruit, these demands would still go a long way towards undercutting the inhumane and repressive environment in which many prisoners find themselves, and are thus worth the long-term struggle they would require. As an initial step in this struggle, organizers have made paramount raising public awareness about issues like the PLRA, which, while obscure to most, have significantly weakened any sense of prisoners’ rights. The need to raise public awareness about the repressive laws and harsh conditions facing prisoners across the country became even more apparent in April of this year following a bloody riot in Lee Correctional Institution, a maximum-security prison long considered the worst in South Carolina. While describing the riot as likely “gang-related,” officials also acknowledged that they made no efforts to intervene for some seven hours, thus leaving at least seven prisoners stabbed to death and dozens more seriously injured in the deadliest incident behind bars in the past quarter century. Considering these circumstances, JLS’s strike call should be seen as serving a dual purpose — shifting public attention back to the issue of the poor conditions behind bars, while at the same time redirecting the attention of prisoners back towards the need for unity. The potential of the latter was perhaps best exemplified during the Pelican Bay Hunger strikes of the early 2010s, as high-ranking prison leaders successfully hammered out an “agreement to end hostilities,” or protracted truce, as part of broader struggle against California’s routinization of solitary confinement. As the example of the Lee riot demonstrates, officials are all too willing to use the divisions amongst prisoners as a way to maintain control, even if these divisions devolve into violent conflicts. Consequently, forging a working unity across racial lines, religious persuasions, and gang affiliations is an essential aspect of prisoner organizing. The start of the 2018 National Prison strike also fell on the anniversary of Nat Turner’s 1831 rebellion in Southampton County, Virginia, further connecting the ongoing prisoner-led resistance to the system of chattel slavery in ways both subtle and overt. Recasting mass incarceration as “prison slavery” — usually by way of the Thirteenth Amendment — is perhaps the growing movement’s most innovative intervention. This terminology speaks to the various deprivations experienced behind bars, the movement’s base in states throughout the former Confederacy, and its long-term objective of prison abolition. At the same time, “prison slavery” and its identification of poorly or unpaid labor as a central feature of mass incarceration, has helped organizers to attract the outside support of the Industrial Workers of the World (IWW). Best known for its service-sector unionization campaigns, the group has developed various methods for supporting inside organizers through its Incarcerated Workers Organizing Committee (IWOC). These methods include using an outside contact available via cellphone to pass messages from one prisoner to another, as well as mailing newsletters with innocuous front pieces that belie organizing information printed in small type several pages later. These more creative methods have joined others, like word of mouth through prison transfers and well established prisoner-oriented publications, like the San Francisco Bay View. The IWOC was an early endorser of this year’s strike and has played a crucial role in helping to spread information about it. At last count, over 150 organizations have now endorsed the strike, and solidarity demonstrations have already taken place in over 10 cities. Dozens more are planned for the next several weeks. As the strike proceeds, one of the more pressing questions is whether or not the strike itself, along with the outside support it inspires, will not just make it through September 9th, but also further the development of more movement organizations on both sides of the wall. These sort of organizations, like Pennsylvania’s Human Rights Coalition or the Free Alabama Movement in the Heart of Dixie, often come out of intense moments of struggle and are generally best positioned to carry the movement forward — particularly within a society too often willfully blind to what takes place in its name behind bars. Dr. Toussaint Losier is an Assistant Professor in the W.E.B. Du Bois Department of Afro-American Studies at the University of Massachusetts at Amherst. He is co-author of Rethinking the American Prison Movement with Dan Berger and preparing a book manuscript titled War for the City: Black Liberation and the Consolidation of the Carceral State.